The Two Gay Geeks received this press release from our friend Emma at EG PR. This is something that we can identify with, we grew up in the midst of this era and it is important for others to know what we experienced. Let us know what you think about this trailer and film. We always welcome your comments and feedback on our content, especially this. With the United States gripped in the panic of the 1950s Cold War, President Dwight D. Eisenhower deemed homosexuals to be “security risks” and vowed to rid the federal government of all employees discovered to be gay or lesbian. Over the next four decades,the longest witch-hunt in American history, tens of thousands of government workers would lose their jobs for no reason other than their sexual orientation. But the mass firings have an unintended effect: they stirred outrage in the gay community, helped ignite the gay rights movement, and thrust an unlikely hero into the forefront of the LGBTQ fight for equality.Partly based on the award-winning book by historian David K. Johnson, THE LAVENDER SCARE illuminates a little-known chapter of American history, and serves as a timely reminder of the value of vigilance and social action when civil liberties are under attack. Director Josh Howard is a producer and broadcast executive with more than 25 years of experience in news and documentary production. He has been honored with 24 Emmy Awards, mostly for his work on the CBS News broadcast 60 Minutes. As Vice President of Long Form Programming for CNBC, he created a unit that produced a series of award-winning documentaries focusing on American business. The 90-minute film Big Brother, Big Business, which explored the ways in which corporate America works hand-in-hand with the government to collect information about the personal habits of private citizens, won the Emmy Award for Best Documentary on a Business Topic, one of three Emmy Awards he earned for CNBC. THE LAVENDER SCARE – Trailer from Josh Howard on Vimeo. This project has been a journey of discovery for me. I’m old enough to remember an era in which The New York Times used the words “pervert” and “homosexual” interchangeably, and I thought I had a reasonably good sense of the history of LGBTQ people in America. 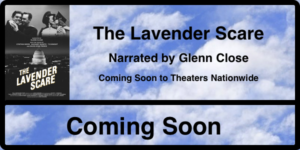 But it was not until I read the book The Lavender Scare by historian David K. Johnson that I learned of the systematic way in which federal agencies went about trying to purge all homosexuals from the government workforce, or that the policy was still being enforced as late as 1995. As a former producer and executive at the CBS News broadcast 60 Minutes, I think I know a good story when I see one. I felt this unknown chapter of our history was one that needed to be told. It’s a story that’s both tragic and triumphant. It tells of the heartbreak of those who lost their jobs and their careers – and even their lives – as a result of the government’s brutal tactics. But it is uplifting as well. It shows how the policy of discrimination stirred a sense of outrage and activism among gay men and lesbians and helped ignite what was to become the gay rights movement. Several years ago, when I began work on this film, my goal was to shed light on an important but overlooked aspect of LGBTQ history. 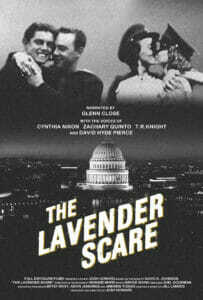 In today’s social and political climate, I see the story of The Lavender Scare as more relevant than ever. I am grateful to the men and women who shared their personal stories on camera – not just the employees who lost their jobs, but the officials who carried out the government’s policies as well. Without their honest and thoughtful insights, this film could never have been made.